Adapted from "IAMSLIC: The Beginning," by Carol Winn, in Proceedings of the 15th Annual Conference, 1989, ix). The International Association of Aquatic and Marine Science Libraries and Information Centers (IAMSLIC) began in 1975 under the name East Coast Marine Science Librarians (ECMSL). Carol Winn, the newly-hired librarian at the Woods Hole Oceanographic Institution (WHOI), and Jane Fessenden, librarian at the Marine Biological Laboratory (MBL), sponsored the first meeting of marine science librarians from the east coast of the US and Canada. Twenty-three librarians from the US, Canada, and Bermuda met for two days to discuss mutual cooperation. Local attendees from MBL, WHOI and the National Marine Fisheries Center increased the number to 49. The program was set up as a series of workshops, tours of scientific libraries in Woods Hole, a boat trip around the Woods Hole area, and a demonstration of computer-based information retrieval (NOAA's NODC). Workshop topics included Sea Grant publications (National Sea Grant Depository), interlibrary loans, collected reprints and exchanges, archives (history of oceanography), maps and charts, and international publications. There were no conference fees or dues. From that first meeting, the Association has belonged to its members. The attendees agreed that meetings would be held annually, that membership should be expanded, and that they would work on cooperative projects. The first projects suggested included a directory of the ECSML with a description of their projects; a union list of oceanographic atlases; sharing of serial lists; and a duplicate exchange clearinghouse. International cooperation was a theme that threaded through all the discussions. Participants decided to solicit participation in 1976 from the Gulf Coast and the Caribbean marine science libraries. The second meeting was held in Woods Hole in September 1976, hosted by WHOI and MBL and supported in part by the US Office of Sea Grant and the NOAA Office of Coastal Management. The Gulf Coast libraries were well represented, and a Caribbean participant came from the University of Puerto Rico. In 1977, the group met in Washington DC, under the sponsorship of the libraries of NOAA. At this meeting, members voted for a formal organization under the name Marine Science Libraries Association. A by-laws committee was named. The membership determined to keep the dues structure as low as possible to encourage participation by libraries in developing countries. In 1978, the Association met in Woods Hole and, after a boisterous debate, changed the name to International Association of Marine Science Libraries and Information Centers (IAMSLIC), accepted a set of by-laws, and elected its officers. Francis Swim (NOAA-LISD) became the first elected President. Carol Winn had previously served as convenor from 1975 to 1978. Each element in the new name of the Association was selected (insisted upon) by different constituencies. It was in the sequencing of these elements that IAMSLIC appeared. IAMSLIC's first newsletter was printed in February 1979, and the first published proceedings began in 1984. As the years and annual conferences pass, "The Beginning" turns into the intervening years. Carol Winn's "description of our roots" brought us through the 70's with all of the enthusiasm and dedication reported by Carol in the first meeting of the East Coast Marine Science Librarians. The early years were also outlined by Kristen Metzger in an ICLARM Newsletter, April 1984. So, having covered the first ten years, let's begin again in Woods Hole at our 10th annual meeting in 1984. The IAMSLIC Newsletter has been an invaluable aid. It started in February 1979 -- just in time! In the March 1984 Newsletter treasurer, Ilene Zaleski, reported a bank balance of $3,105.60, and Membership Chair, Alison Chesney, a total of 148 members from a broad array of libraries in sixteen countries. For the 1984 meeting, Ruth Grundy was our Program Convenor and the staff of the MBL/WHOI Library and NMFS our hosts. Looking back through fifteen years of growth dramatically emphasize how far we have come technologically. We were discussing electronic mail systems, front-end software, gateway services, telnet applications for the first time in the fall of '84, and as we had so much to discuss, we decided to lengthen our annual meetings to allow more time to talk. Kristen Metzer became our Newsletter editor, a job she would hold for nine prolific years. The Union List of Serials (MUSSEL) was about to be published, Carol Winn was updating our IAMSLIC Directory, Janet Mitchell had designed our logo, Norman Howden was working on a Union List of Atlases, and we published, for the first time, the Proceedings of the Annual Conference. The International Cooperation Committee was formed in 1986, under the Chairmanship of Tom Moritz, to promote international cooperation among aquatic science libraries. This one action defined much of the organization's mission in the following years. Allen Varley and David Moulder hosted the first meeting of EURASLIC at Plymouth, England in 1988, and in the following year that group discussed regional membership in IAMSLIC. In 1989 the IAMSLIC brochure was printed in French and Spanish as well as English. We had our first President from outside North America, Cecile Thiery, from Monaco, and in 1990 Kay Hale attended the Thirteenth session of the IOC Technical Committee on International Oceanographic Data and Information Exchange at the United Nations. 1991 was a watershed year. We became the International Association of Aquatic and Marine Science Libraries and Information Centers. IAMSLIC remained our much-loved acronym but our name changed to better reflect our many members working with freshwater information organizations, especially those members of EURASLIC. The same year we officially recognized EURASLIC (European Marine and Freshwater Sciences Librarians, Information Scientists and Documentalists), CYAMUS (North American West Coast Group), SAIL (Southeast Affiliates of IAMSLIC Libraries), the West African Regional Group, and we began to form ties with PIMRIS (South Pacific Regional Group). After a three-year struggle, Kristen Metzger, succeeded in overcoming the financial, bureaucratic and political barriers required to bring our first Russian delegate, Ivan Bukhanevich to our 1991 conference in Galveston. The twinning policy, which provides support through a "buddy" system for libraries that cannot afford membership, was approved. We formed the ad-hoc Internet working committee, established an electronic conference on the Internet, and discussed electronic document delivery. As we expanded and strengthened our organization and integrated our international members, we planned our first European meeting at the Alfred Wegener Institute in Bremerhaven, Germany. By 1992 our IAMSLIC brochure, the harbinger of our expansion, was printed in Chinese and Japanese. Tom Moritz represented us at a meeting of UNESCO's Group of Experts on Marine Information Management (GEMIM) convened under the Committee on International Oceanographic Data Exchange (IODE) of the IOC. Over the years we have become heavily involved with this group's work on standards, surplus documents, and the Global Directory of Marine Organizations, Libraries and Scientists. David Coleman and Sandra Abbott-Stout hosted our 20thanniversary meeting at Waikiki Beach in Hawaii in 1994. This celebration was the culmination of a long "swim" from our origins. At the anniversary banquet, Carol Winn was honored for her role in our genesis, and her twenty years of leadership. Over the years the organization has given special recognition to several members. 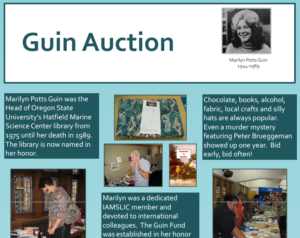 The Guin Fund, to aid participants from developing countries, was set up in 1990 to honor Marilyn Guin, our deceased colleague. In 1991 two honorary members were named: Allen Varley and Eric Marshall. In 1998 a sustaining membership in memory of Ruth Grundy was created, and the plans for the 25thanniversary celebration include a reception to honor all our past presidents. 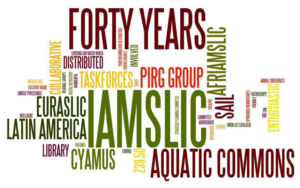 During the more recent years, IAMSLIC has striven to formalize its goals and organization, promote cooperation and sharing of resources, and more fully facilitate communication among the growing aquatic science community. In 1996 Natalie Wiest represented IAMSLIC at a joint meeting of GEMIM and IODE in Athens, Greece, and in that year our treasury was sufficiently full to partially support regional group activities and projects. Peter Brueggeman graciously offered to provide a permanent server site for us at Scripps Institution of Oceanography. A trial project supported by IAMSLIC, on the use of the Internet for document delivery was launched between PIMRIS and Scripps in May of 1997, and a new edition of our Directory will be published in multiple volumes with the support of IOC. Our 24th annual conference in Reykjavik, Iceland was held jointly with the Polar Libraries Colloquy. This was a rare opportunity to visit Iceland and meet with information specialists with an interest in Arctic ecology. This year, as our "Beginning" turns into the "Present" we are planning the 25thannual meeting in Woods Hole. We have 295 members, double the 1984 count, and our treasury balance has grown fifteen fold. We've expanded, grown, and traveled, but remain true to the cooperative spirit engendered by those original twenty-three librarians who met in Woods Hole in 1975. May the future years exhibit the same growth, global outlook and enthusiastic involvement of all our members. by Barb Butler, Oregon Institute of Marine Biology. We migrated back to Woods Hole in 1999 for our 25th meeting. From there we continued our globe-trotting and went on to convene conferences in Victoria, British Columbia; Brest, France; Mazatlan, Mexico; Mystic, Connecticut; Hobart, Tasmania; Rome, Italy; Portland, Oregon; and Sarasota Florida. What a busy and productive ten years! There are now six regional groups: AFRIAMSLIC, Cyamus, EURASLIC, Grupo Regional Latinoamericano, Pacific Islands, and SAIL. We continue to reach out to colleagues from developing countries with our "Sponsored Membership" program and we are 385 members strong. Our technology needs have been well met. Thanks to Steve Watkins we have the very successful "IAMSLIC Z39.50 Distributed Library" for our resource sharing program, an online membership database and electronic voting. IAMSLIC acknowledged Steve's many contributions with the first ever "Lifetime Member Award" in 2007. The resource sharing program took a new direction with the development of the Aquatic Commons shared institutional repository which is hosted by the Florida Center for Library Automation. The Aquatic Commons is complementary to the OceanDocs repository project in which many members also participate. Both repositories are regularly harvested along with numerous others into the Avano search engine developed by Ifremer, offering open access to a significant and growing body of full-text documents. By 2008 we changed with the times and switched from our electronic newsletter to a news blog. We are headed to Fiji in 2008, then on to Belgium, Argentina and Tanzania for joint-meetings with each of our regional groups with the hope that those not able to travel internationally can attend a regional joint-meeting. Membership brochures continue to be produced in three languages and IAMSLIC continues the fine tradition of bringing together marine and aquatic science librarians from across the globe.